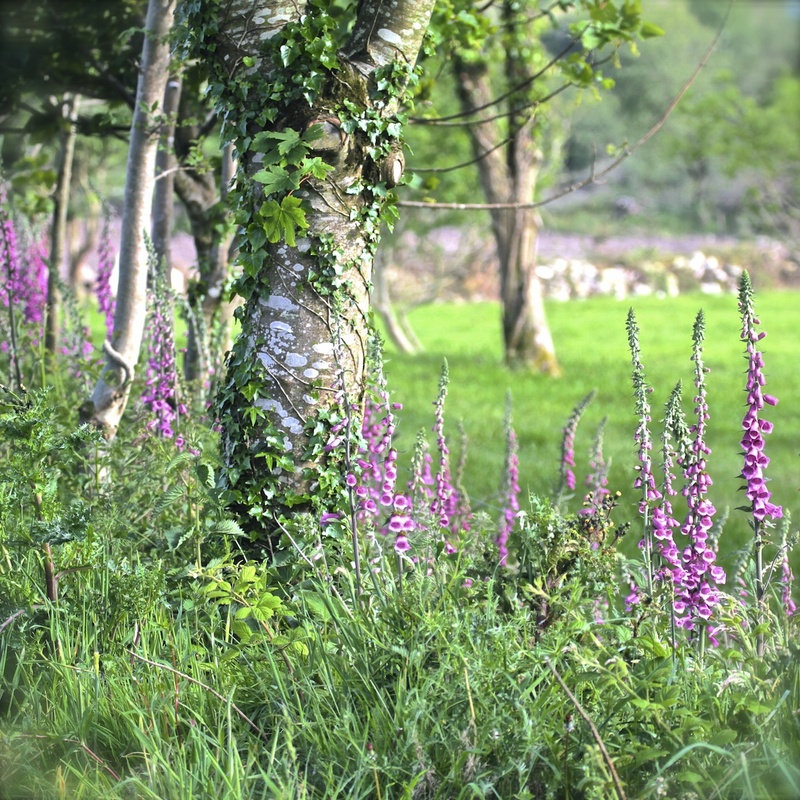 Foxglove Lane Studio and this website are called after the Common Foxglove (Latin; Digitalis Purpurea) ( Lus Mor as Gaelige) growing here in this patch of County Waterford Ireland. They bloom in early summer, creating long borders of colour in the hedgerows. I believe they are Ireland's most spectacular wild flower. Bees love them and disappear up into their trumpet shaped flowers. Sometimes they grow in large drifts. Other times in a single bloom. They love dappled shade, the base of trees, and cleared ground. Their magic is in the glorious shades of pinky/purple, the shapes of the flowers and their height often growing to 5 feet tall. They are associated with myths and tales of faeries and wee folk. I love the name foxglove, a word that contains, fox, glove and love. It conjures up so many images. There is no doubt in my mind that the presence of these flowers on our little boreen is one of the reasons we now live here! 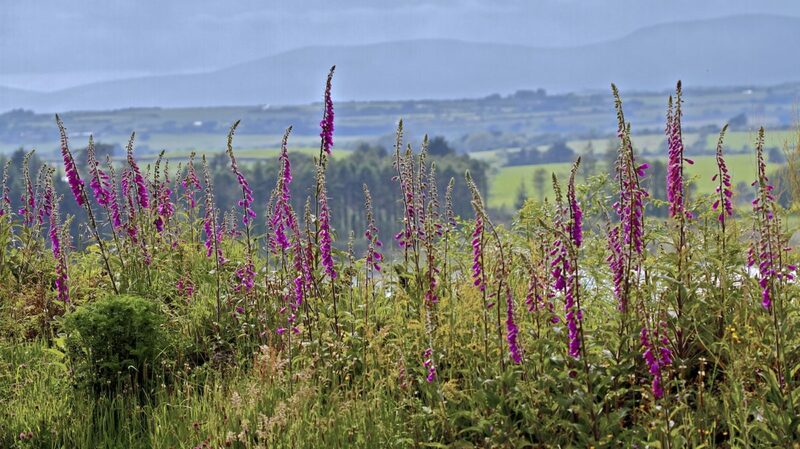 Foxgloves love acid soil and hilly parts. You will usually find ferns, heathers and gorse living side by side with them. In spite of changing environmental factors, they seem to be surviving incredibly well. Many of their seeds have now found their way to my front door and are all over our couple of acres. Happy Days! 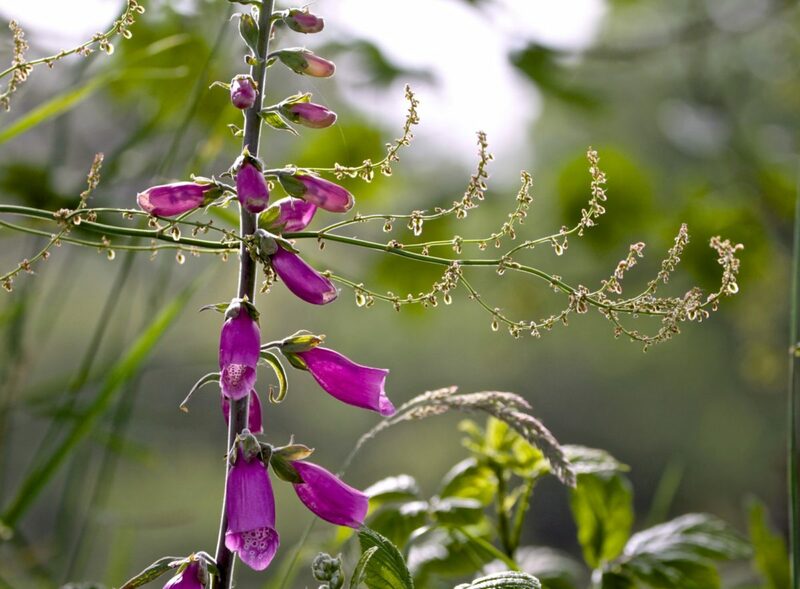 Where does the name foxglove come from? 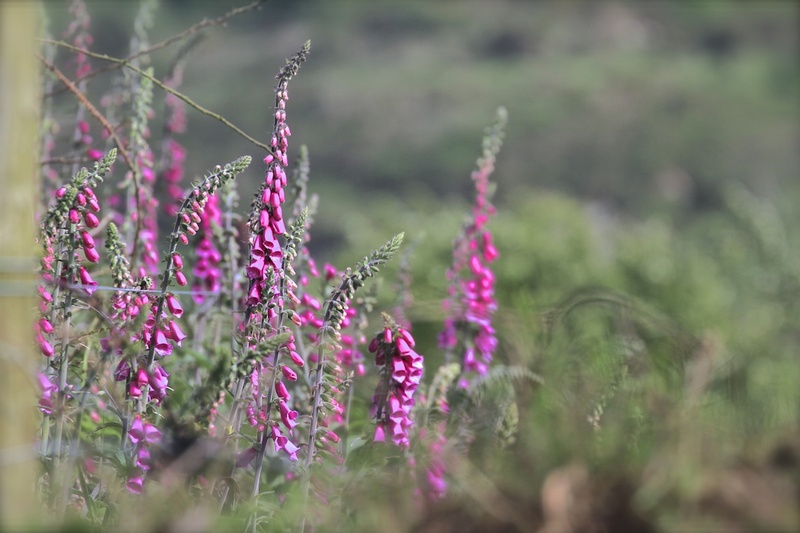 There is some debate as to whether the name Foxglove comes from Folksglove the name for the flower in some countries of Europe. In Welsh they are called Maneg Ellyllyn literally The Good People's Glove, or the Faeries Glove. In Irish they are called Lus Mor (Great Herb), Méara cait, cats' fingers, also Lus na mBan Sí, Herb of the Faery Women' or Méirín Púca, Little finger of (the) Pooka. According to William Henry Fox 1847, "in French it is also a glove, gantelée (little glove), and in German, fingerhut a thimble. In Greece it is ‘the trumpet flower’ from the Greek salpigga, a trumpet. In Scotland witches’ thimbles, the witches, taking the place of the fairies." In Scotland they are sometimes called Todd’s Mittens or Toddies. 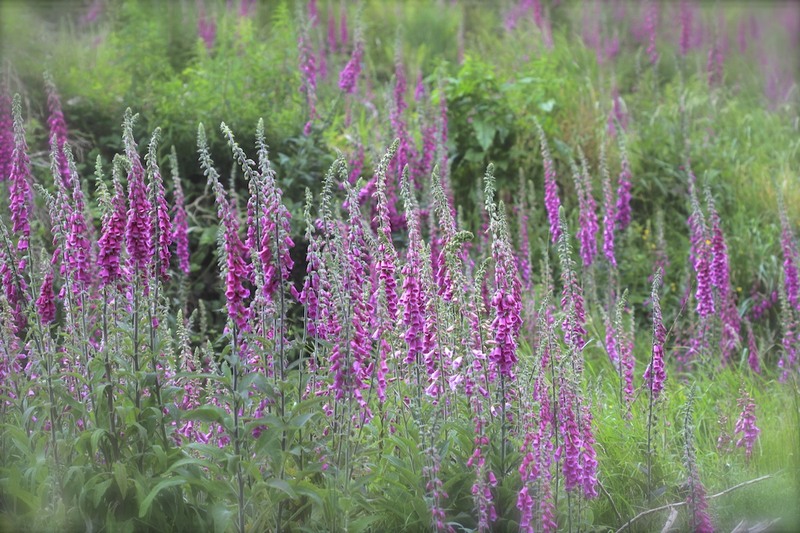 Oxford University Press says, "The Century Dictionary gives several names of the Digitalis: fox-fingers, ladies’ fingers, and even dead-men’s bells. In sum, foxglove means foxglove, and this disturbing fact has to be accepted. “One of the queerest crazes in English etymology,” says Skeat, “is the love of paradox, which is often carried to such an extent that it is considered mean, if not despicable, to accept an etymology that is obvious.” He cited attempts to invent a clever explanation of foxglove as an instance of the “queer craze.” But, with due respect to the great scholar, it must be said that obvious etymologies are often wrong, that foxglove causes legitimate surprise, and that folk etymology is the result of speakers’ healthy rebellion against the impenetrability of the words we use (or the conventional, seemingly arbitrary nature of the sign, as linguists put it)." Here they were often called Ladies Fingers too and somewhere I heard that the spots inside the flowers were the bees’ footprints. That's one I could beleive.